Two years ago, DICE launched their Star Wars Battlefront reboot, right on the cusp of a new movie release for the franchise. Even though it only focused on the original trilogy, the game was a financial success. Though a faithful adaption, the arcade shooter wasn’t a particularly good game. It suffered numerous problems relating to balance, spawning, and map design. It was also criticised for lacking content, launching with just four large maps for its iconic Walker Assault mode and no campaign. Star Wars Battlefront II addresses these issues head-on, as it includes single player and more large maps for its equivalent Galactic Assault mode. The sequel also covers all eras in the franchise, from the prequels to the sequels. But despite its fantastic graphical prowess and healthy amount of content, the various gameplay elements are at war with each other like the Jedi and Sith battles from a long time ago. 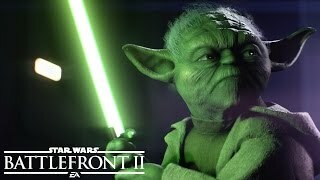 On the surface, Star Wars Battlefront II is much the same as its predecessor: a first or third person arcade online shooter with recharging abilities. But the sequel has many changes to multiplayer that are quite significant. Basic troopers are now split into four classes, each with different abilities. Specialists use a sniper rifle and can see through walls; Officers buff nearby soldiers and deploy turrets; Heavies can shoot for long periods and stand their ground with a shield; and Assaults can run around with a shotgun-type blaster in close quarters. These classes do not share weapons, and there are only four per class. Sadly, none of these base troopers can use the jump pack, so movement is quite grounded compared to the previous game. This four-pronged trooper setup is closer to DICE's other shooter franchise, Battlefield, albeit without quite as much teamwork. There are some team-oriented gadgets that do help, like the Assault's scan dart, or the Officer's bubble shield. It also tries to encourage teamwork by granting point bonuses if you play alongside the people in your spawn wave. The idea is to create groupings, but it also disadvantages the players who might think outside the box, or those who want to join a squad of friends. Regardless of the class selected, teamwork actions and playing the objective do usually provide good point bonuses. The battle points you earn are quite important because they grant access to special reinforcements, heroes, or vehicles during each match. Unlike the previous game that featured silly glowing pickups strewn across the map, you merely have to acquire enough points to spawn in a tank or as a flame trooper. Battle points are retained after death, so the longer the match lasts the more chance you can use them. You can save up for a powerful hero, like Yoda, but that could see your team fail early. If you buy a jet pack trooper, it might be strong enough to claim the objective and move to the next stage. Saving or spending points is actually a clever strategy element for players to consider. Some vehicles are point-earning machines though, like the tank, so good players might be able to keep using special reinforcements without returning to the battle as a regular trooper. The change to acquire heroes (and vehicles) is better for aesthetics and gameplay, but it does reward the players that need help the least. Base troopers, and most purchasable units, use a Star Card system to buff their abilities or change their skills. Cards unfortunately increase the skill gap significantly, as experienced players can have faster health recharge, better shields, or extra damage. To level up a class or character, you need more, or better, cards and they are found inside random loot crates. These crates are sometimes rewarded for doing challenges, but most will be acquired by spending the paltry amount of credits earned from playing. You can craft cards, but crafting parts are also generally found inside crates and are quickly exhausted. Crafting higher tier cards requires more parts, so after about 15 hours the levelling process slows down. Apart from being a grind, it's a needlessly unintuitive and complex system with three types of currency. One of the currencies, crystals, can be acquired by spending real money, although that has been disabled after justified backlash. Changes to the credit earn rate could alleviate the grind, although the random acquisition of online stat boosts, with the chance of duplicates, makes for a bad progression system. Multiplayer is split into five modes that support a varying number of players, from 40 down to just 8, although the focus in the sequel is mostly on the larger battles in Galactic Assault and Starfighter Assault. Galactic Assault (GA) is the main showcase mode in Battlefront II as it usually features a bit of everything across large and linear maps. Like Walker Assault from the previous game, it's a series of objectives broken into stages with 40 players on the ground and maybe in vehicles. The objectives differ slightly across the 11 levels, although several begin with attackers escorting large vehicles that can be damaged by defenders, and these usually progress several stages. This can be seen on Hoth, with the massive AI-controlled walkers assaulting the rebels across the snowy landscape before troops infiltrate the icy base. Other maps focus on area control, and these games sometimes don’t progress beyond stage one. Like on Jakku, where the conflict is rather personal with no armoured ground units, as players run through a ship junkyard to control areas inside a crashed destroyer. Matches were often one-sided in GA, possibly due to the map design. Some maps start out extremely open, like Kashyyyk, and may allow attackers to flank through maze-like structures that are hard to defend. The final objective on Kamino is absurdly cramped, as now defenders can hunker down and cover a handful of extremely narrow pathways. And by then the defenders have a bunch of heroes that can wait around corners. It's a meat grinder, although some people like that. There are some handy flanking routes on some maps that most players are not utilizing yet, but the chokepoint design, combined with third person corner peaking, typically gives defenders the advantage once they can set up a foothold. Galactic Assault has the potential to be a good mode after a few balance tweaks, but the funnelled level design might prevent it from truly excelling. Starfighter Assault is the second largest mode and a substantial combat arena for players who want to be a fighter pilot like Luke or Anakin. With 24 players and staged objectives, it is a better mode than the equivalent in its predecessor. Occurring in space or planet-side, the aerial battles are focused and hectic. Defenders might need to protect moving ships, and attackers need to destroy them without suffering too many deaths. There is no doubting that weaving between space junk and shrugging off pursuers is quite cool. Escorting bombers and attacking weak spots also makes it feel like an epic space battle, straight from one of the movies. The fun aerial mode still has AI-controlled enemies, so even average players can get kills and feel like they are contributing. Like in GA, Starfighter Assault matches can be over too quickly if the defenders play the objective, and these small doses will leave you wanting more. With so much focus on these larger battles, the smaller modes suffer a bit. Most of the maps are merely a subset of those in the GA mode, which rarely works too well. So a game of Blast (TDM) can occur within the Naboo palace with 20 players, the very same location that is fought over in the last stage of GA with twice as many combatants. But even though player counts are more suited to these smaller arenas, the map designs are not usually up to the standards set by other shooters. Endor's imperial base is just an open area with objects randomly strewn about to break sight lines, so it has no flow whatsoever. The elevated TDM map on Kashyyyk does not feature in the GA mode, and it has better structure thanks to an interesting central area inside a hollow tree. Not many of the subset maps compare well to the small arenas in the previous game, which is a disappointing side effect of the focus on the larger encounters. Strike mode is the objective version for infantry-only battles and like Blast it also has no hero units. There are two main types of this 16 player mode that depend on the map played: on Takodana, the first order grab an artifact and run to the other side of the map to capture it; on Naboo, the attacking droids have to sabotage two clone trooper vehicles. Running with the artifact (or intel) is ugly chaos with near endless overtime. And sabotaging objectives doesn't have the finesse of similar games. Both modes force teams to either defend or attack, not both, so it feels too much like the larger modes. Strike doesn't swap teams after a round win either, it is best of three and then it switches; six rounds per map wears thin quickly. Strike compares poorly to the smaller and dynamic objective modes in the last game—like Drop Zone and Cargo—and the map arenas generally don't help the action either. Heroes vs Villains is the only other mode in multiplayer and takes place within small maps with just four players per side. It exclusively involves the iconic characters from the franchise, like Rey, Kylo Ren, Chewbacca, Boba Fett, Lando, and Darth Maul, so you won't get stomped as a regular trooper like in the last game. The goal is to kill one randomly selected character before the other team does the same. The droid announcer in this mode has some funny quips when heroes perish and heroes talk to each other amidst the chaos, which keeps the mood light. Since the characters have large health reserves, some of the battles can last more than a few seconds. These 1v1 scenarios can be rather intense as you deploy abilities, jump, block, get knocked back, and dodge attacks. It's a fun mode and can be quite athletic when you play as the lightsaber characters on either side. While multiplayer had some technical problems in the first game, the sequel makes no real effort to alleviate issues. There is no server browser or map filter; so you might miss out on the best maps. Instead of lobbies, the game will throw players into near-empty servers, unable to do anything until more players join. Teams do not balance until a new map is loaded, and you cannot swap to the losing side. There is no ping shown anywhere, and there were some infrequent lag problems like movement stuttering, ability delays, dying before enemies fired, and taking damage from around corners. Like its predecessor, Battlefront II is a bit of a letdown when it comes to multiplayer connectivity, especially from DICE, and needs a way to at least select maps. If you just want to kill easy computer targets then Arcade mode is your best chance. In this solo mode you can be a regular soldier, special trooper, or a hero. You will then need to defeat scores of regular AI soldiers on small maps, either with a time limit or with a team backing you up. The difficulty can be customized and you can also earn credits to buy loot crates, until you hit a stingy daily limit. The mode is constant action and a good way to test the abilities, maps, or weapons in lab conditions. It's a shame that vehicles can't be tested the same way, and the mode is unlikely to gain preference over the rest of the multiplayer. Single player was absent in the last game, but it has been included for the sequel. 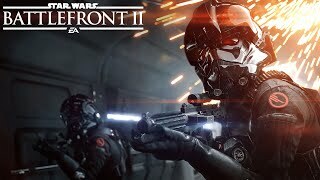 The campaign begins with players assuming the role of Iden Versio from the Galactic Empire, just before the final assault on the second Death Star by the rebellion. This puts the story at the end of the original trilogy and it follows on from there. Iden is the leader of the hotshot Inferno Squad and her father is an Admiral that insists on retaliating after the Emperor is killed. While other Star Wars games have allowed players to defect to the dark side, it's still refreshing to start as a "bad guy" and massacre rebel scum who scramble in fear. But the light side has a way of seeping through the darkness, and Iden reconsiders her alliances. The turning point comes too early, as she tries to help refugees on her home planet, and seconds later she's mowing down her old friends while a storm rages on. After a decent start, the campaign falls down drastically with terrible mission design as it takes the perspective of other characters. A good portion of the game involves defending a small area from a deluge of enemies. You'll play as Luke Skywalker and use the force to smash bugs in some caverns, and later you assume the role of his sister and do the same against Stormtroopers on the Naboo multiplayer map. There are too many defensive sequences in the miserly 5 hour campaign, and they are all unimaginative. The campaign was an opportunity to focus solely on Iden as she transitions, but it brushes this aside to give unnecessary tutorials on how to play as the multiplayer heroes for around half of the journey. With no internal conflict, confusion, or loneliness, Iden's personal story lacks substance. Aside from some decent Starfighter missions and a few ground assaults, it isn't really worth playing from an action standpoint. At least we get to use Iden as a hero in the multiplayer, with her fun rapid-fire blaster weapon. The craziest part of the campaign is that it also ends on a cliff-hanger, presumably to link with the upcoming movie, but this could have been avoided by simply culling the shallow final mission. The franchise has so much depth that Iden deserved a better introductory tale. If you just want to play the single player or multiplayer for the whizz-bang graphics, then you won't be disappointed. It faithfully reproduces all eras, from the hilarious droids on Naboo to the first order troopers in Maz Kanata's castle. The clone factory on Kamino is glorious, by the way, with the battering rain and turbulent ocean views mixing nicely with the clean white interiors. The wookie homeworld has quite nice looking swamps. Endor still has that great foliage although other locations take over when it comes to shrubbery showcase. The narrow alleyways in Mos Eisley on Tatooine are packed with strange critters and space junk. Fighting inside the Death Star II is as awesome as weaving between its post-destruction wreckage. Several of the maps have multiple versions with different lighting conditions, such as night-time, fog, or sunset, which is a nice touch. Of course it’s a pretty great audio package too, with those thundering explosions and zaps from blaster fire. Troopers talk to each other, calling other players cadets if they engage in harmless friendly fire. The presentation qualities are certainly a force to be reckoned with and it also runs extremely well. Like a troubled Jedi, Star Wars Battlefront II is a game with many internal conflicts. The new class-based trooper setup and battle point system are smart improvements, but the lootbox-orientated progression is slow and messy. Galactic Assault battles can be addicting and exciting, although map bottlenecks and balancing issues are occasionally dire. Starfighter Assault is a great arcade dogfighter experience with focused objectives, yet the smaller maps in the infantry modes suffer because so much of the game's focus lies elsewhere. Fighting as heroes is fun and athletic, although the online lag and connectivity options are like a lightsaber to the back. And finally, Iden's journey in the single player is a wasted opportunity, but at least the graphics are awesome for the whole package. Like the struggle between good and evil, the game’s uneven design is perhaps more faithful than its impressive adaption of the universe. 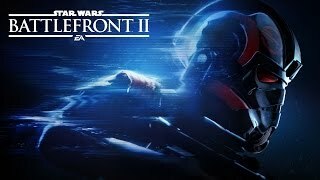 So is Star Wars Battlefront II good or bad? Well, as the Emperor would say, good is a point of view. Still an excellent visual package. Blaster effects and vehicle designs, and everything in between, are faithfully designed for all franchise eras. Music can be pretty good in the campaign, audio sounds are generally awesome. The arcade third person shooting can be quite enjoyable. AI is dumb in the campaign. Online combat is better, although star cards can make for larger skill gaps. Starfighter battles are usually good. After a decent start, the mission design collapses with horrid defend tasks as it sloppily jumps perspective to different hero characters. Iden's story deserved something much better. Some good maps, but also many flaws with reoccurring bottleneck design. Starfighter Assault is quite enjoyable and immersive. Hero battles are fun. It has some balance issues and the progression is a grind. Connectivity features are poor (no server browser or ping). Runs great offline and online. Load times are modest in most cases. Some rare disconnects and lag spikes were observed. Although an improved sequel, there is both good and bad in Star Wars Battlefront II. Class-based troopers and a smart reinforcement system are hindered by horrid progression. The large modes succeed, when there are no bottlenecks or balance issues. And if the single player cared about its main character, then it would have complimented the game’s astounding presentation.